In the land of no wings, the KFC bucket is king. 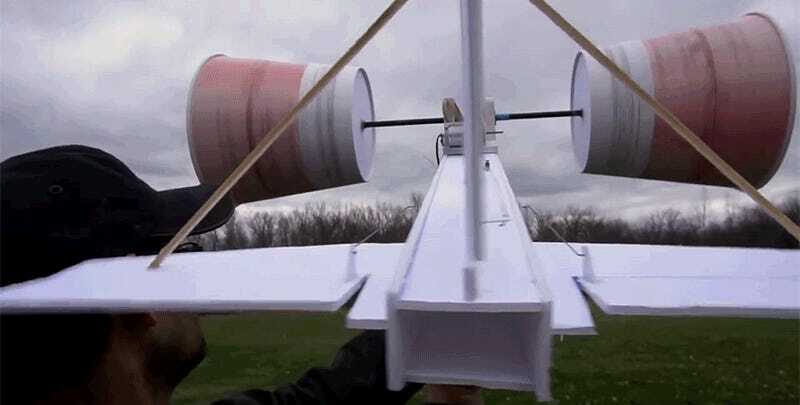 That’s the theory YouTube supergeek Peter Sripol set out to prove recently by building an RC plane with nothing but greasy KFC buckets for wings. And guess what: it worked. You’re probably thinking that a bucket-winged airplane that can actually fly is some sort of tardy April Fool’s joke. However, there’s sound science that explains how cylinders or spheres can be used to create lift if you make them spin a little. The phenomenon is called the Magnus Effect, which explains why dropping a basketball off a high dam or a roof with a bit of backspin will cause the ball to travel in a parabolic arc. The KFC bucket plane works in a similar way. After a lot of failed designs—and really, really bad puns—Sripol and his buddies finally built a plane that they can maneuver through the air in a controlled manner. It’s not pretty, but it flies. The resultant video is fairly long at 18 minutes. Just jump ahead to the 11-minute mark to see those chicken buckets soar.